We restore creeks and wetlands primarily in the San Francisco Bay Area of California, U.S. 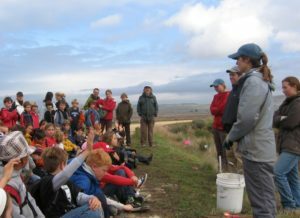 Since 1993, 45,000 students have planted over 50,000 native plants in creeks and wetlands. We provide lessons in the classroom and field for about 120 K-12 classes per year. We begin each school year with Watershed Week, our teacher training that brings together our whole network of teachers, partners and staff to study a particular science topic. Our STRAW Faculty (a wonderful group of retired teachers and naturalists) provide more lessons and support for teachers. Each class receives a pre-restoration lesson before their restoration, so they can learn about the native plants and why restoration is important. 1) Providing a chance for 5-18 year old children to do professional quality restoration has been very successful. It brings science learning alive for students, and encourages them to consider science careers. In addition, doing this real work that contributes to nature and their communities gives them a sense of efficacy and confidence. It also connects them to the natural world in a profound way.2) Professional development for teachers has given them support and a way to integrate science and other subjects together in studies and actual work to benefit the natural world. 3) We have restored over 35 miles of riparian creek and acres of wetlands. We will be focusing more on wetlands in the next 5 years because of a grant we just received. We will be able to serve more students and teachers with wetlands education and opportunities to restore 1.3 miles of degraded shoreline back to healthy wetlands habitat. Yes. 1) It did not work well for us to have teachers required to do STRAW by their principals. It’s very important, at least for our project, that teachers self-select. We have never charged a teacher or student for any of our services, but the teachers are not paid for their time when they attend Watershed Week, and there is some extra work involved. 2) We don’t charge for our services, but finding enough funding – donors, grants and contracts—is extremely difficult sometimes. Not having enough resources really can make things challenging. 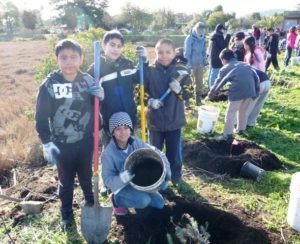 For the coming year or two, things look a bit brighter regarding funding to do what we’re doing – about 56 wetlands and riparian restorations with about 120 classes. 3) We would like to spread the STRAW model, if it’s helpful to others, but don’t want to overwhelm our staff. Right now, we’re experimenting with a Pilot Project in a community about 400 miles away, thinking that we will help it begin and then it might be independent. We need to find better ways to leverage what we do…while focusing on keeping our model here intact and thriving. PR and marketing; Health and safety; Fund-raising; Project planning. Other Information: We are not a wetlands centre, per se, though we work with partners who have a wetlands centre, and we do habitat restoration in wetlands and wetlands education.